If you are skipping my review because of a "spoiler" make sure you catch the links to other people's posts about this challenge below. 1. Anne's world expands once again. It starts out small, at Green Gables, then encompasses her community (Anne of Avonlea) and then takes her to Redmond where she begins her years at college. As Anne's world grows, so does she. 2. Anne makes a new home at Patty's Place with three other girls who are fun and jolly. 3. Montgomery introduces her love of cats into the series in Anne of the Island which I consider quintessential Montgomery and so I'm glad that they are in there. 1. Anne's new friends lack the Diana quality. As Anne grows up, she realizes more and more that she can't hold on to the way things are. Things are always changing. She regrets it and yet she moves into it. But I have a hard time letting go of the past and of Diana. Diana's not gone exactly. She just gets married and starts moving in a different direction than Anne and so their ways begin to naturally part. 2. Anne starts calling everyone "dear." All her girlfriends are referred to as "dear." I HATE it when people address me with that term of endearment. I realize to some, pretty words like "dear" and "darling" etc. sounds dreadfully sincere. "Yes, dear, I would love to go out for a walk in the park." But to me, overuse of the word just makes it downright annoying and it's hard for me to take people seriously who dole out pet names right and left. Somehow it cheapens a relationship for me and makes me feel put down. (Maybe this makes sense to you and maybe it does not.) It feels -- patronizing is, I guess, what I'm trying to say. Don't ever call me "dear" please. I just hate that. And I wish Anne didn't give in to the urge. She'd have sounded more forthright and believable if she hadn't stooped. I don't know why Montgomery did that to Anne. Maud doesn't really strike me as the type who would go around "dear-ing" everyone to death. But for some reason - she did it with Anne and I find this mortifying and regrettable. As humans, we're made to relate to one another and one of the ways we do that is through places and things. It's hard to see changes happen to the things and places we love in as much as it is hard to witness change in people themselves. It's humanity. It's beautiful. I like this poignant truth that Montgomery includes in her tale. "I'd like it to end unhappily, because that would be so much more romantic. But I understand editors have a prejudice against sad endings. I heard Professor Hamilton say once that nobody but a genius should try to write an unhappy ending. I know from reading about Montgomery's own life and opinion of the Anne-girl that she wanted to write unhappy endings every once in awhile. She also did NOT want to write as much about Anne as she ended up doing. But the public and editors demanded Anne and happiness and so Montgomery wrote it out that way for the masses. I, personally, enjoy the happy endings but I wonder if Lucy questioned her own abilities or was needling her editor with that particular quote. The most admirable character in this book, in my opinion, is Gilbert. I won't copy out a kabillion quotes for you but I like the fact that Gilbert was a friendly guy, a hard worker, loyal and fun-loving and only ever had eyes for one girl with red hair and gray eyes. He's not the cad that you can't like and it's not so full of himself that he doesn't need you in the picture either. He's just happy. And sincere. And I like that. Even as Anne fumbles about, he remains steady and true and so, for my part, I think the winning character in Anne of the Island is not the title character, but the one who supports her in everything. Abi and her daughter are reading Emily of New Moon together (so go egg them on so that Emily gets some air time around here)! An Almost Unschooling Mom made PUFFED SLEEVES with her daughters! (You've got to go check out their craft!) I love it!!! I like Anne less and less as she ages. By the time she marries and has children, she's almost not even there. Oh! This is one of my favorites from this series! Patty's Place always made me feel so peaceful. Um... my review of the books 2 & 3 publishes tomorrow. Promise you'll still like me?! I would love to have a "Patty's Place" with some of my real life and bloggy friends. It would be SO much fun!!! I don't know where you live, Carrie, but down South here people use terms of endearment a lot, "hon" being the most common, though someone at a drive-through called me "Boo" the other day. ??? Anne wasn't from Southern USA, but it was a different time and probably didn't sound patronizing then. Can't wait to read these all again! I like Amy's comment. I'm almost through Rainbow Valley, which I'm loving, but I have to admit, I'm not sure I care for Anne - she seems aloof, and even self-centered, at times. Maybe, I need to read Windy Poplars, after all. Thanks for the mention, though :) We are having fun with Green Gables. Stephanie's Mommy Brain - You are testing all decent bounds! ;D haha! Of course, I'll still like you. But then, I've never been fond of nicknames either. I've only ever had three that I could stand. #1 - My mom called me Carebear which was shortened to "Care" with age and strangely I never noticed to mind. Otherwise, I'm mostly just opposed to calling me anything other than plain ol' unromantic Carrie. And if you say my name while looking me in the eye with sincerity at the same time - all the better! 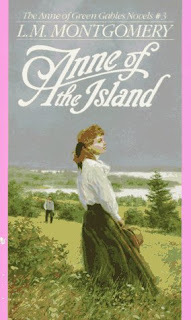 Anne of the Island isn't my favorite, but it ranks way up there because that is where Anne finally realizes that she loves Gilbert (that is the romantic side of me coming out). I also love Patty's place and the camaraderie of all the girls, so much better than when she was at Queen's, plus Philippa Gordon is a total hoot! I also wonder if the "dear" thing was a popular craze at the time the book was written or during a period of time in Montgomery's life--kind of like "awesome" was a popular saying when I was in high school. Reading about Anne is making me want to dig all of them out again. Thanks for the great review! Anne of the Island IS my favorite (love college, love Patty's Place, love the funny bits, love the tragedy when Gilbert proposes), but I really enjoyed this post. I never thought much about how Anne says "dear" so much, but I think I read it sort of the opposite of you--Anne is so OVER-sincere, OVER-loving, especially as she grows older... I thought "dear" was used to show how VERY VERY CLOSE she was to her friends--rather than used casually the way some people use "hon" (I hate that, too). I should reread the Anne books sometime. I enjoyed them when I was young, but Emily of New Moon was my first L.M. Montgomery love, and still my favorite. I'm so enjoying your posts on Anne. I think like some others I like Anne best when she's younger and rough around the edges. I tried reading Rainbow Valley recently, but she seemed too perfect for me. Annd of the Island was one of my favorites. I guess I didn't love Diana as much as others plus Patty's Place was magical. Oh dear. I know, dear, how much you'll scream if I once again state that I've never read any of the Anne stories, so I'll refrain from upsetting you, sweetie pie. Thanks for sharing your thoughts, hon! Once again I had to come back and reread this after posting my own review. I didn't notice "dear" so much -- that seems to me to go with a certain era -- but I did notice "honey" and it grated on me. These days among women it's used almost sarcastically, though I know it wasn't meant that way in the books, but it was hard for me not to read a condescending tone to it. I appreciated Gilbert's constancy but didn't understand why he would let everyone think he was engaged to Christine when he never was. I don't think it was to hurt Anne. Maybe it was so that no one would bug him and Christine abut dating others because it looked like they were a couple? I don't know. I enjoyed this book. Maybe not as much as the very first one and the one about Anne's first year of marriage, but I liked it a lot. It brought back a lot of memories of college years.